Today we investigate Kerikeri. 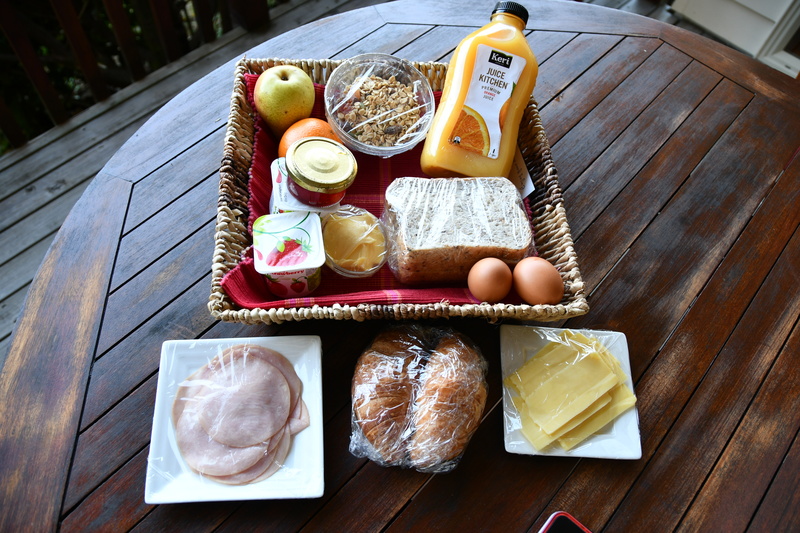 We take a leisurely and early breakfast on our veranda (we are still awakening at Oh goodness me hours). Last evening our hosts delivered a basket of goodies to help us start the day. Clad now in shorts and T shirts, for it is 27°C, we drive to Aroha island which is a warden assisted “eco-island” accessed by long causeway through the mangroves. We are required to sign in so that if we get lost someone comes to find us at sun-down which is comforting. The kiwi bird – emblem of NZ and soubriquet of its inhabitants – dwells in such dank, lush green forests. Sadly for us it is nocturnal so remained unseen. One could buy night treks for $40 with a 50% guarantee of seeing one. We decide to pass up that kind offer. Tall Kauri trees, found nowhere else in the world, grow here. They are conifers related to Monkey Puzzle trees which grow slowly up to 50m in height with amazingly straight trunks up to 5m in diameter. Not surprisingly the early settlers made short work of most of them for their canoes, houses and latterly, telegraph poles. They really are the straightest timbers I have ever seen. They are now a protected species. Among these giants grow Silver Tree Ferns – curious plants with silvery undersides to their fronds. It is said that the Maouri ancestorstors tore off these fronds and laid them upside down along pathways to better reflect the moonlight and illuminate their nocturnal travels. Clever chaps. It is just the end of summer here. The deciduous trees are beginning to shed their leaves. The fruit trees have long since fruited. 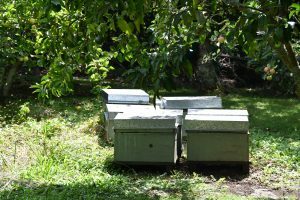 We wander through a grove of orange trees among which dwell several colonies of NZ bees. I guess that orange-flavoured honey is a perk for the wardens who manage this lovely idyll. What a job from heaven. Kerikeri is clearly a lovely place to live. The houses around the suburbs (it is a very small town) are individually built, and thus to their owners’ taste. 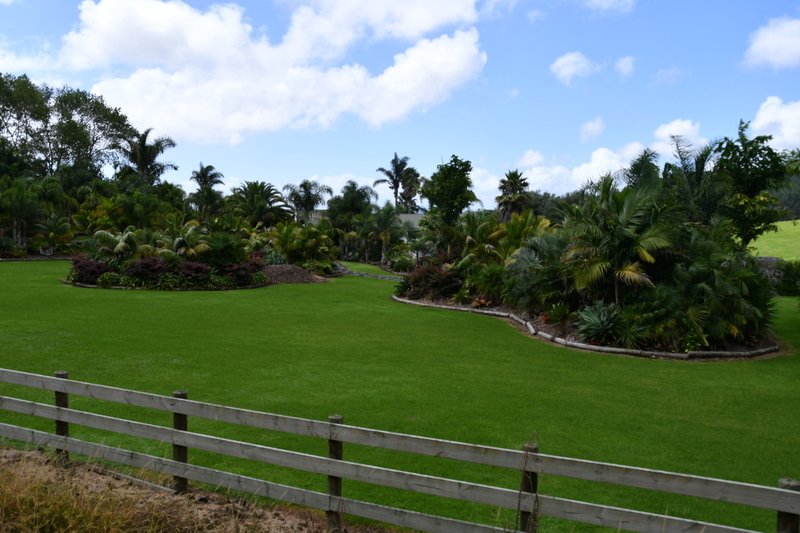 As with suburban Australia they typically enjoy a half acre or whole acre plot. 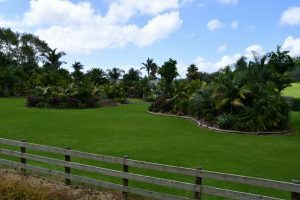 Land is cleared; walls are made of lava boulders; the roads are wide with grass verges full of Agapanthus and white lilies, and the houses are set way back. It is all very spick and span, clean tidy, well ordered and smacks of wealth. I guess many of these dwellings are second / holiday homes. I gather that if you have done OK then a pad on the Bay of Islands is just the thing. The nearest to this I have seen in the UK is Sandbanks in Poole or Jersey. 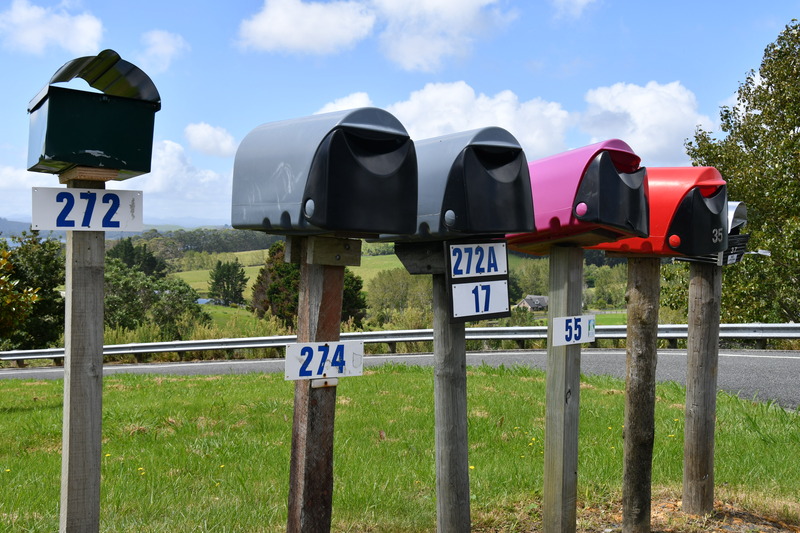 NZ postmen’s lives are made easier by the American custom of positioning remote mail boxes at the road end of their curtilage. Sailing boats a-plenty bob on moorings at the ends of the gardens of these houses. Like Jersey, metre of foreshore is snapped up by the next grand dwelling rendering public access difficult if not impossible. Worse still there is a preponderance of grumpy signage proclaiming “No beach access” or “No exit” or “Last turning point”, basically “Go away and let us alone to our self-satisfied wealth”. I guess ’twas ever thus. Was it worth the long journey north? There is still much to see so we shall form a view as we go. This entry was posted in New Zealand 2018 on 16 February, 2018 by David. Not sure whether you got my post. So I will try again. Pleased to hear you arrived safely and are now in the far North. When you are there do go to Waitangi which is where the treaty was signed with the Māori people. Worth a visit. From memory we also visited Russell and surrounding area. Beautiful countryside and houses. Enjoy the weather and the sunshine. Thanks for the tip. Been there done that. Now in the Coramandel. 400 km drive today Ugh. 30C is good. You don’t mess about then. Wow that’s some drive to the Coromandel. Hope the weather holds. We were there some six Christmas’s ago in a tropical cyclone!